Summer Sessions, One-Day Camps and Workshops/Intensives - Payment is a one-time fee, and no further charges will be incurred without approval. Monthly Classes - Enrollment opens 4/1/19 for the 2019/20 Dance Year which begins 8/12/19. Payment of the annual enrollment fee plus first month's tuition will secure a spot in any classes with availability. First month's tuition is processed at the time of registration / monthly tuition is charged on the first of each month thereafter. The 2019 Winter Showcase will be held on Sunday afternoon, Dec. 8th at Braswell High School. Classes will be divided into 3 different showtimes (Show A, B, or C), and parents should make note of which show their dancer(s) will perform in prior to purchasing tickets. There is NO DRESS REHEARSAL required for Winter showcase. Winter Showcase Fee: $100.00 - single dancer; $50.00- each additional sibling collected on October 15, 2019 to cover the cost of technical staff, Winter Showcase staff and rental of Braswell High School Auditorium. Seating is reserved and all tickets must be purchased online in advance. Tickets are $15 to $20 and are inclusive of the per ticket service fee. Online ticketing opens at 8 am on 10/15/19. Visit the Winter Showcase Tab of the website for the link to purchase tickets. Winter Showcase costume costs are $115 plus tax and include a pair of performance tights and all accessories. Costume payments are non-refundable and therefore all class transfers must be made prior to costume orders being placed. The costume fee of $115 plus tax will be collected for each costume on September 15, 2019. Late registration will be available for new students after the 9/15/19 costume payment deadline, but costumes ordered after this date will ship separately from the group order and therefore will incur additional costs of $45 per costume. All accounts must be current to participate in the Winter Showcase. The 2020 annual Spring Recital is tentatively scheduled for Sunday afternoon, May 17, 2020 with dress rehearsal two weeks prior on Sunday, May 3, 2020. Dates will be finalized prior to February 1, 2019. Attending dress rehearsal is a requirement for recital participation. Recital Fee: $115.00 - single dancer; $50.00- each additional sibling collected on March 15, 2020 to cover the cost of programs, technical staff, recital staff and rental of Braswell High School Auditorium. Fee also includes video download of the show approximately 8 weeks following the recital. Seating is reserved and all tickets must be purchased online. Tickets are $15 to $20 and are inclusive of the per ticket service fee. Online ticketing opens at 8 am on 4/1/20. Visit the Recital Tab of the website for the link to purchase tickets. Recital costumes will be communicated to each class in the fall semester once specific costumes have been selected. Costume costs are $115 plus tax and include a pair of performance tights and hairpiece. Costume payments are non-refundable and therefore all class transfers must be made prior to costume orders being placed. The costume fee of $115 plus tax will be collected for each costume on November 15, 2019. Late registration will be available for new students after the 11/15/19 costume payment deadline, but costumes ordered after this date will ship separately from the group order and therefore will incur additional costs of $45 per costume. The deadline for late registrations will be 12/15/19. All accounts must be current to participate in the spring recital. LITTLE ELM REC CENTER PARTICIPANTS: First Month's Tuition (Sept) is processed at the time of enrollment to secure a spot in the class of your choice. For subsequent months (Oct 2019-May 2020), monthly tuition is collected on the first of each month beginning 10/1/19. The $60 Annual Registration Fee is waived for all LERC students. Contact registration@3-Ddance.com with tuition questions. 1. Monthly tuition is payable ONLY through automatic debit from a credit card or bankcard. Family agrees to keep current their contact information and credit card/debit card authorization form on file and will notify the office immediately of any changes. 2. Tuition will be debited on the 1st (first) of every month. Tuition is to be PAID IN FULL during holiday months as our rates are based on a 4-week month, inclusive of several additional family enrichment events. Since some months are longer, the extra classes received equal those missed during holidays. The studio remains open for all 1-day holidays and follows Denton ISD for both weather closings and extended holiday breaks (Thanksgiving, Christmas and Spring Break). A $35.00 late fee will be added after the 5th of each month. Any student whose account is over 15 days past due may not participate in class. Once enrolled in dance class, your child's place is considered reserved for the season. A financial commitment is made for the duration of the dance year, including the recital (unless we are otherwise notified that your dancer will not participate in our recitals). We will continue to charge tuition until we receive a written withdrawal notification from a parent. 3. Notice of withdrawal must be received via email 15 days before the first day of the following month. If a student withdraws from classes for a period of one month or more and wishes to return to classes, space cannot be guaranteed in the same class. Please email registration@3-Ddance.com to notify the studio of a student's withdrawal. 4. Enrollment fees and tuition payments are NON-REFUNDABLE. There are no refunds, pro-rating, credits or transfers of tuition for missed classes if a student withdraws mid-month, or for withdrawals mid-semester if discounted semester payment has been made. 5. Enrollment fees paid once each dance year. 6. Checks accepted ONLY if paying tuition for a full semester. 7. A 10% discount is available for payment by semester rather than month-to-month (Fall Semester = August through December / Spring Semester = January through May). 8. Private lessons are paid on or prior to the reservation time and may be rescheduled up to 24 hours prior to the time of the scheduled reservation. 9. Creative Arts Preschool Program tuition is due the first of the month and amount is dependent on which day option student is registered for. Monthly tuition is as follows: 3-day option = $340, 2-day option = $235, and 1-day option = $125. Semester discounts, consecutive class discounts and and standard sibling discounts apply. We will continue to charge tuition until we receive a written withdrawal notification from a parent. The Annual Registration and Supply Fee is processed at the time of Enrollment to secure a spot in the program. Monthly tuition begins September 1st. Private Lesson Rate - $65 per hour (Payment processed at time of reservation). A sibling discount of 20% off monthly tuition is available for the 2nd sibling (Regular Monthly Classes only - does not apply to summer camps/summer session or workshops). A sibling discount of 50% off monthly tuition is available for the 3rd/4th sibling (Regular Monthly Classes only - does not apply to summer camps/summer session or workshops). August Tuition will be processed at the time of enrollment to secure a spot in the selected class for returning students. For new students, the annual enrollment fee plus first month's tuition is processed at the time of enrollment. 3 Day Option: $220 enrollment and fall supply fee is due at time of enrollment. This fee covers supply costs for the fall semester (September through December), curriculum costs, classroom supplies and studio resources. All school supplies/ classroom supplies will be provided by 3-D Dance. A $150 spring supply fee is due on January 1, 2020. $340 monthly tuition is due on the first of each month. Standard late fees, consecutive class discounts, sibling discounts, and semester discounts apply. 2 Day Option: $135 enrollment and fall supply fee is due at time of enrollment. This fee covers supply costs for the fall semester (September through December), curriculum costs, classroom supplies and studio resources. All school supplies/ classroom supplies will be provided by 3-D Dance. A $100 spring supply fee is due on January 1, 2020. $235 monthly tuition is due on the first of each month. Standard late fees, consecutive class discounts, sibling discounts, and semester discounts apply. 1 Day Option: $100 enrollment and fall supply fee is due at time of enrollment. This fee covers supply costs for the fall semester (September through December), curriculum costs, classroom supplies and studio resources. All school supplies/ classroom supplies will be provided by 3-D Dance. A $75 spring supply fee is due on January 1, 2020. $125 monthly tuition is due on the first of each month. Standard late fees, consecutive class discounts, sibling discounts, and semester discounts apply. 2. In order to receive the full benefit from your class, arrive on time. 5. School age children and teens: please practice respect. Students are not to be socializing in a disruptive manner during the class with other students. Please come early or stay late to enjoy friends in the waiting area. Please honor your teacher and fellow students by giving full attention and cooperation. You will be advised if we feel any student is not well adjusted to the classroom environment for any reason over time. 6. During class if a student complains of being ill, or sustains an injury and cannot participate, the instructor will send them to the office and the parents will be notified. 7. Only students with a pre-existing sickness/injury are allowed to observe class. The parents should notify the office if a student is to observe class. Keep your child home if they have any of the following conditions: fever above 100 degrees, vomiting, diarrhea, a skin rash, nits or lice, eye infection, any communicable disease, or if it is clear that your child is not feeling well. Dance class is education and fun, however, an important part of class work is developing an attitude of discipline, dedication and respect for teachers and fellow students. We trust that following our classroom etiquette will provide an environment whereby classes at 3-D Dance will be a positive experience for all involved. * Students are expected to attend their classes regularly and to be punctual. * Consistency is essential for a dancer's progress. * Proper warm up of the muscles is necessary to prevent injury. If a student arrives 10 to 15 minutes late to class they may be asked to wait until their is a natural break in the class. * Please call the office if absences are foreseen. 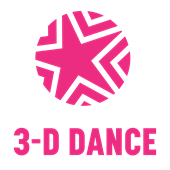 * 3-D Dance staff will not administer any medications, creams or sunscreen to students. Only a parent may administer any medication to their child. Students are placed in appropriate levels based on a variety of criteria. After consideration of any prior training, age, dance technique, personal strength, technical proficiency and intangibles such as talent and maturity the director and staff will decide the proper class level for each student to ensure the highest quality of training for each student. A placement period may be needed to determine the appropriate level for our Older Children and Teen Divisions. Class placement is determined at the end of each school year, although level promotion may occur at anytime during the year at the discretion of the instructors. New students may email the studio for placement questions (registration@3-Ddance.com). Students are required to come to class in proper dance attire, be on time and be promptly picked up afterwards. While waiting, they should remain in the lobby until their teachers walks out to greet them. Students may not leave class without a teachers permission. Food and drink (except bottled water) are ONLY allowed in the lobby AND NOT allowed in the studios. Parents who bring small children are asked to actively supervise them in the lobby out of consideration to the staff and others waiting in the lobby. Students who are disruptive in class may be asked to leave class. Students should respect all staff and other students and should expect the same courtesy in return. 3-D Dance = Dedication, Determination, and Discipline. IT IS UNDERSTOOD that in dance, as in any physical activity, there is an inherent risk of injury. By acknowledging this statement, the parent or legal guardian acknowledges that this risk is present in the student's dance class and will not hold 3-D DANCE or any representative of 3-D DANCE responsible for any such injury. Furthermore, the parent/legal guardian and student should make known to the instructor and the studio director any past injuries, or medical conditions that could affect the performance of the student in class. Group and Individual photographs of my child may be displayed on the 3-D Performing Arts Academy Website, Social Media Platforms, Recital Programs and Slide Shows, Studio Scrapbooks, Studio Bulletin Boards or Studio Advertisement Flyers. In the event that the regular teacher will not be in attendance, a trusted 3-D Dance professional performing arts instructor will serve as a substitute. 1. Focus on the child's behavior, rather than the child. 3. Observe children in order to anticipate potential difficulties. 4. Establish eye contact and calling the student by name to gain a child's attention. 5. Remaining physically near the child in situation where he or she may be losing self-control. If all else fails, the student will be removed from the situation in a way to ensure that the classroom remains a safe and positive learning environment for others.